Someone walking homeward happens to look at the crescent moon around 8:15 pm. 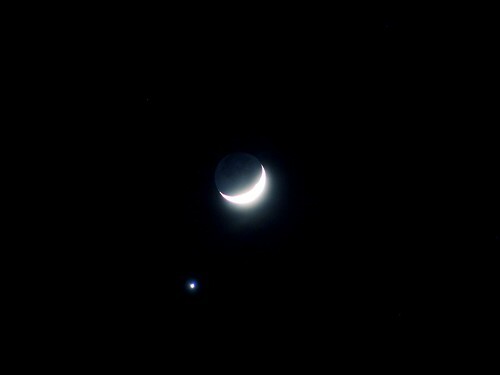 The planet Venus hangs very close, about two and a half moon diameters below. The batteries are dead, but 3 spare batteries are miraculously available. With 3 new cells and 1 almost dead cell, the camera sputters to life. Pictures are feverishly snapped between 8:20 and 8:40 pm. Upon googling, it is found that the time of closest approach for viewers in the San Francisco Bay Area was 8:16 pm on May 19. 1 in 12,145,345, give or take a multiple of pi. 1 in 2: either you take a picture, or you don’t. ” …3 spare batteries are miraculously available” — that’s the part of this story that takes it from ordinary good luck into the realm of the truly supernatural. Everyone knows that spare batteries are never on hand when you need them, especially at the very moment a celestial event is taking place. So count your lucky stars, Polaris. Oh, you already did. And what a stunning image it is! Tai: I am *never* lucky with these things, so this is a first of sorts. Just one disappointment: I couldn’t share it with anybody. Campus was all but deserted on the weekend. My picture does no justice to Venus. The sky was bluer than it appears in the picture, but I had to reduce the exposure to prevent the moon from blanking everything out. I might have been able to pull off #1 and #2 but having the camera and the spare batteries on hand to capture the moment is beyond the realm of my usual luck. I am glad all the probabilities converged in your favor because that is one gorgeous photo! I can’t do the maths, but that’s one beautiful photo – quite extraordinary! Stefanie and Litlove, thanks. “Maths” as opposed to “Math” brings back memories of school days :). Great picture!!! I enjoyed looking at that same moon, it was beautiful.